This self-explanatory guide introduces the basic fundamentals of the Finite Element Method in a clear manner using comprehensive examples. Beginning with the concept of one-dimensional heat transfer, the first chapters include one-dimensional problems that can be solved by inspection. The book progresses through more detailed two-dimensional elements to three-dimensional elements, including discussions on various applications, and ending with introductory chapters on the boundary element and meshless methods, where more input data must be provided to solve problems. Emphasis is placed on the development of the discrete set of algebraic equations. The example problems and exercises in each chapter explain the procedure for defining and organizing the required initial and boundary condition data for a specific problem, and computer code listings in MATLAB and MAPLE are included for setting up the examples within the text, including COMSOL files. 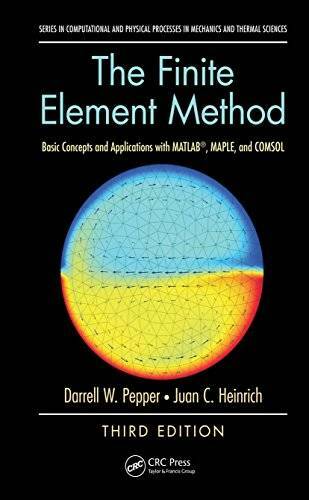 Widely used as an introductory Finite Element Method text since 1992 and used in past ASME short courses and AIAA home study courses, this text is intended for undergraduate and graduate students taking Finite Element Methodology courses, engineers working in the industry that need to become familiar with the FEM, and engineers working in the field of heat transfer. It can also be used for distance education courses that can be conducted on the web. - Inclusion of MATLAB, MAPLE code listings, along with several COMSOL files, for the example problems within the text. Power point presentations per chapter and a solution manual are also available from the web. - Additional introductory chapters on the boundary element method and the meshless method. - Revised and updated content. -Simple and easy to follow guidelines for understanding and applying the Finite Element Method.